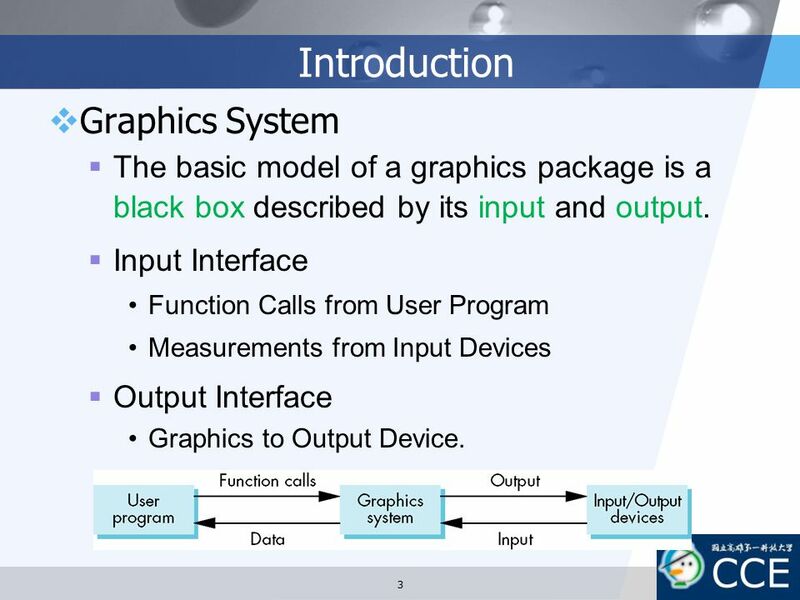 The basic model of a graphics package is a black box described by its input and output. 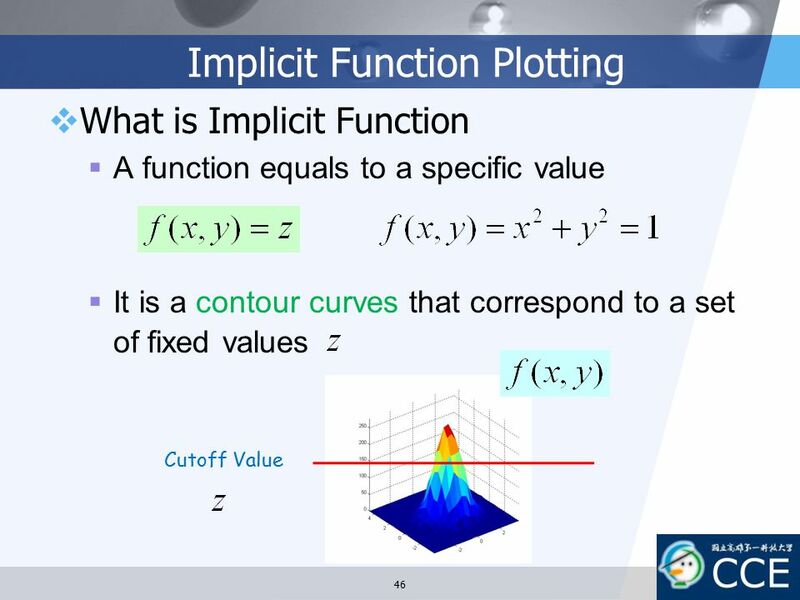 Input Interface Function Calls from User Program Measurements from Input Devices Output Interface Graphics to Output Device. 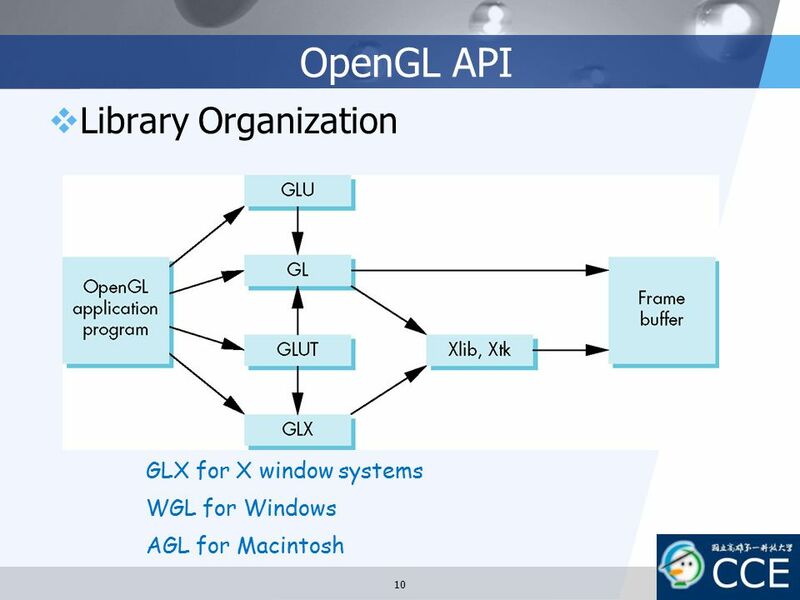 Core Library OpenGL on Windows. 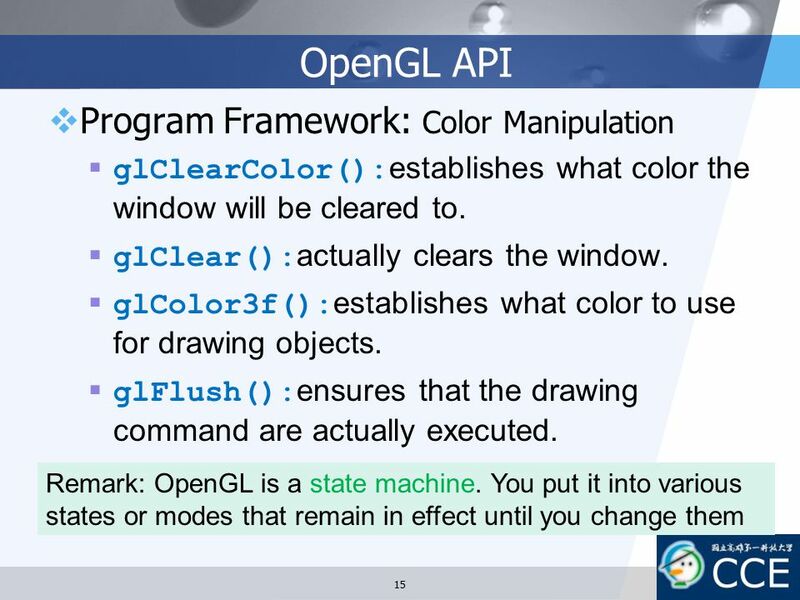 OpenGL Utility Library (GLU) It uses only GL functions to create common objects. 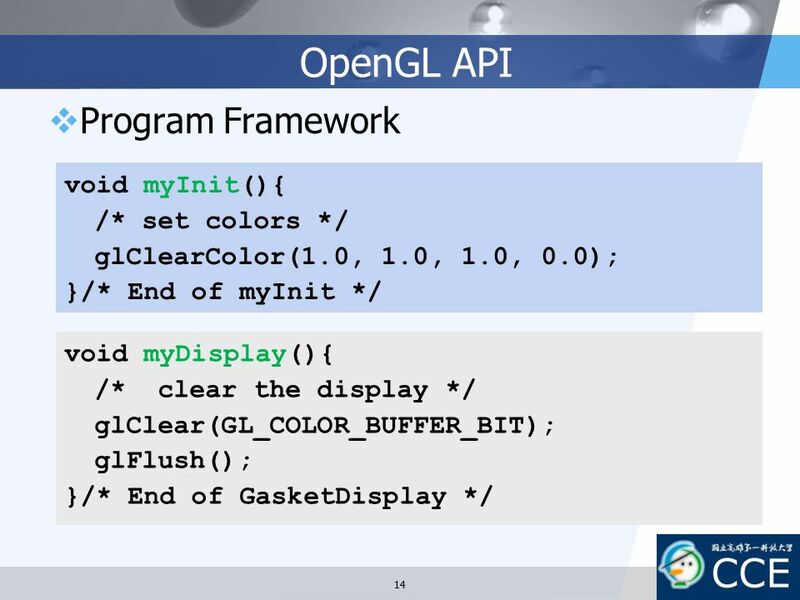 It is available in all OpenGL implementations. 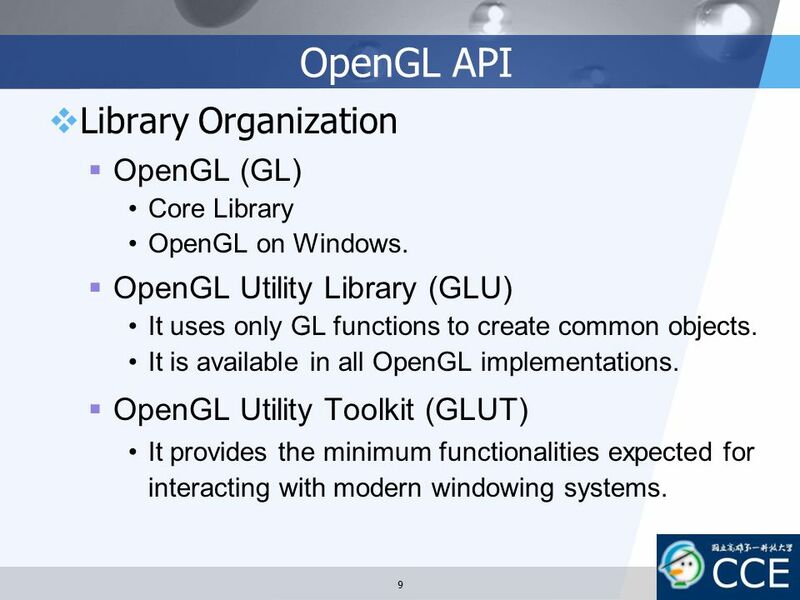 OpenGL Utility Toolkit (GLUT) It provides the minimum functionalities expected for interacting with modern windowing systems. 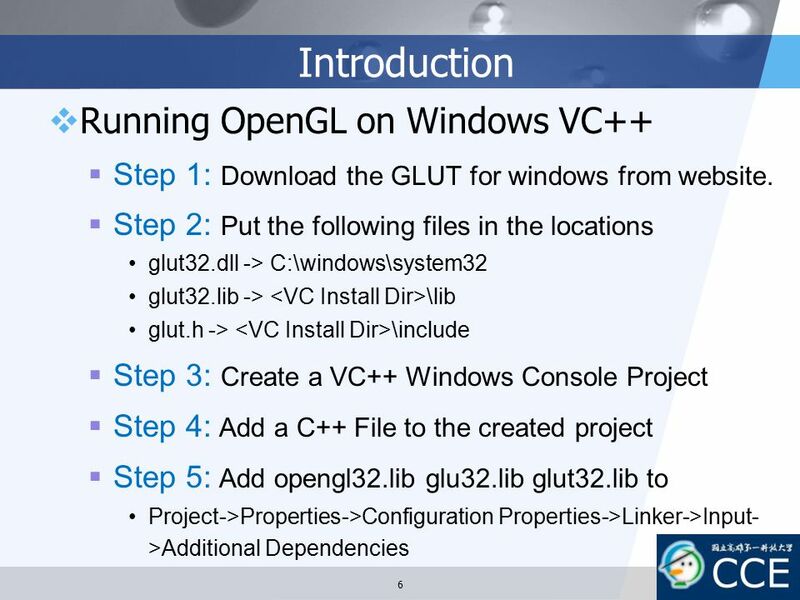 glutInit():initializes GLUT and should be called before any other GLUT routine. 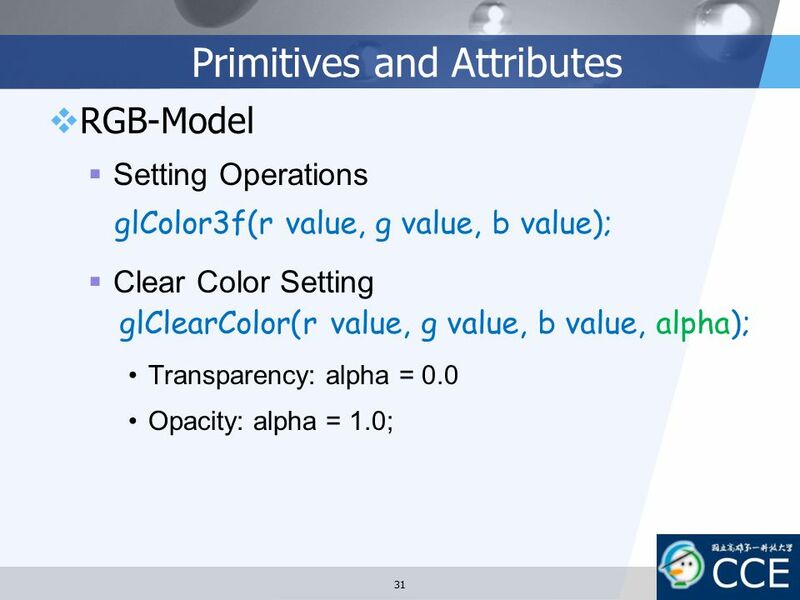 glutInitDisplayMode():specifies the color model (RGB or color-index color model) glutInitWindowSize(): specifies the size, in pixels, of your window. 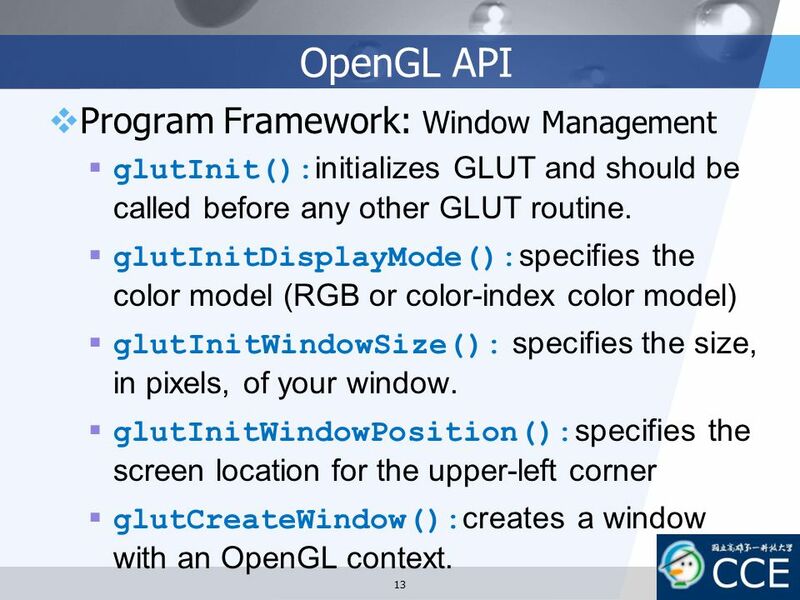 glutInitWindowPosition():specifies the screen location for the upper-left corner glutCreateWindow():creates a window with an OpenGL context. 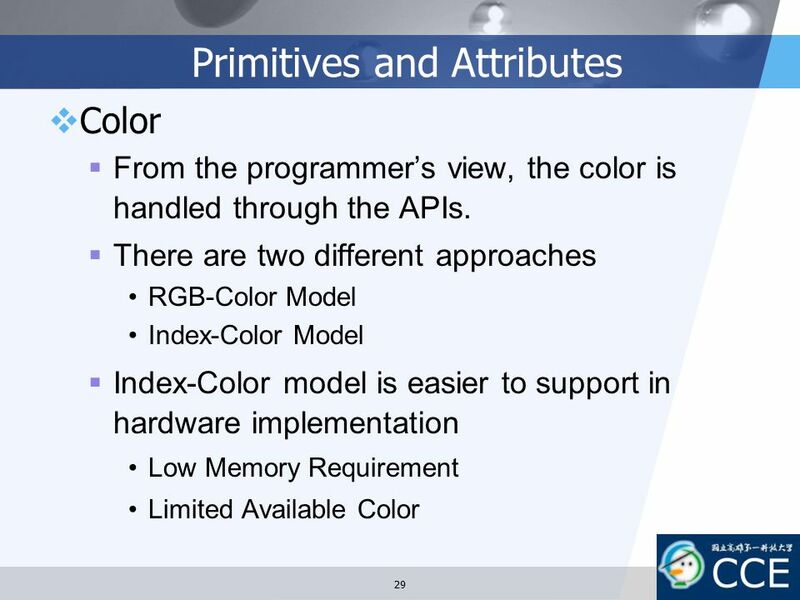 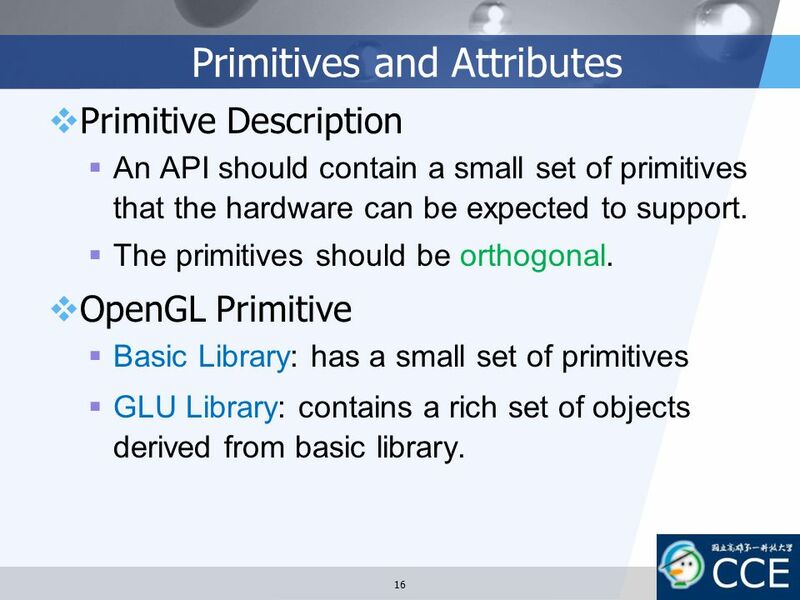 Primitive Description An API should contain a small set of primitives that the hardware can be expected to support. 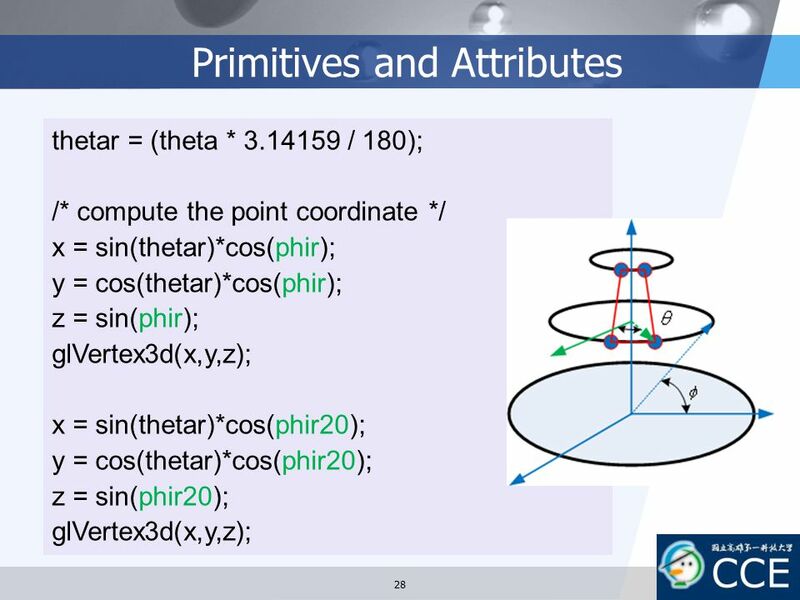 The primitives should be orthogonal. 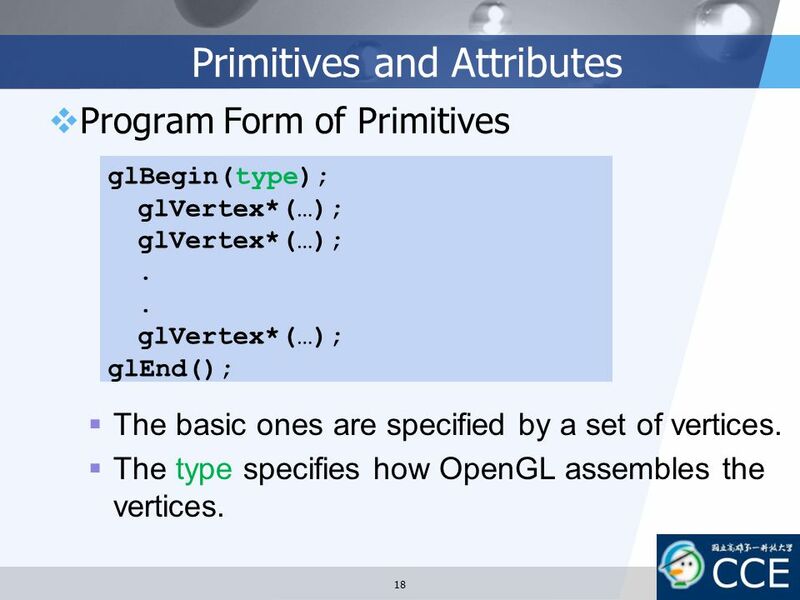 OpenGL Primitive Basic Library: has a small set of primitives GLU Library: contains a rich set of objects derived from basic library. 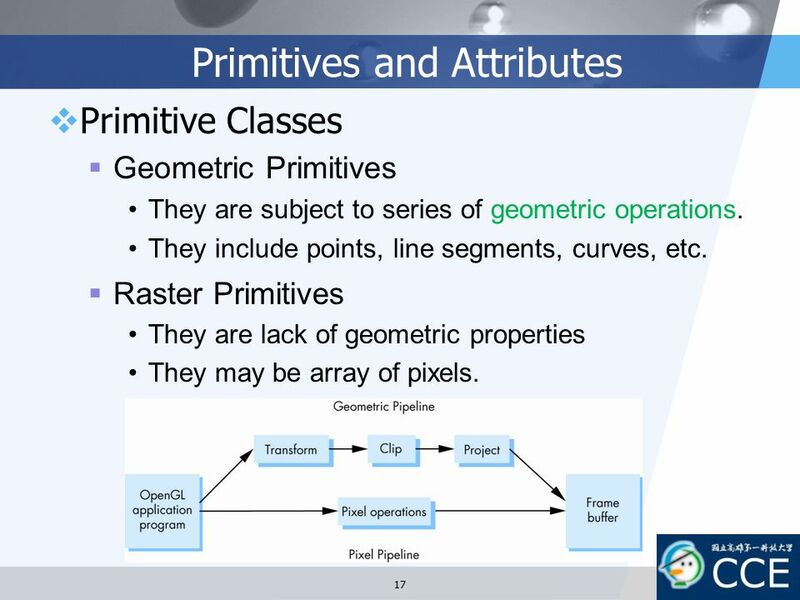 Primitive Classes Geometric Primitives They are subject to series of geometric operations. 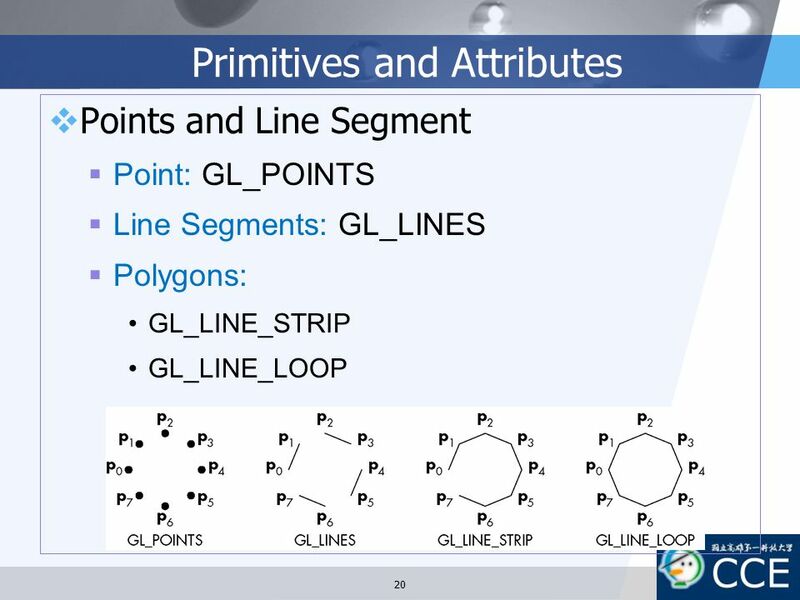 They include points, line segments, curves, etc. 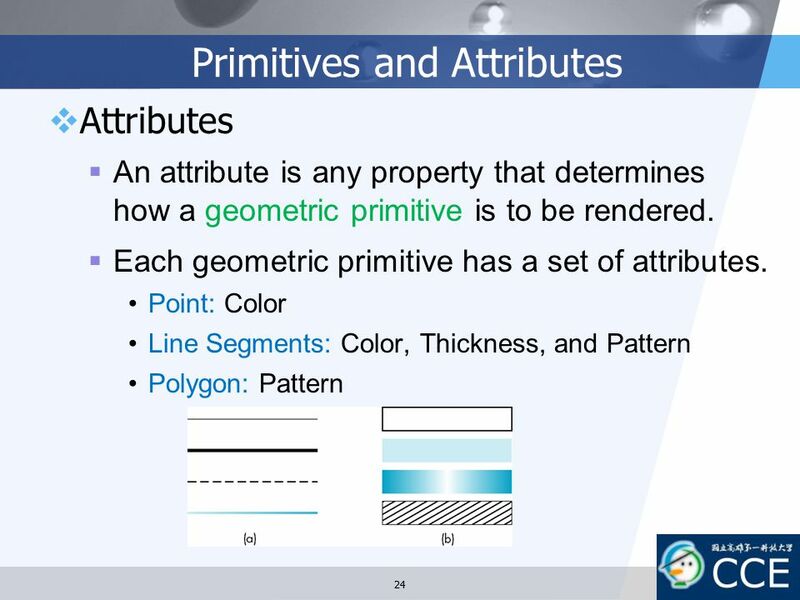 Raster Primitives They are lack of geometric properties They may be array of pixels. 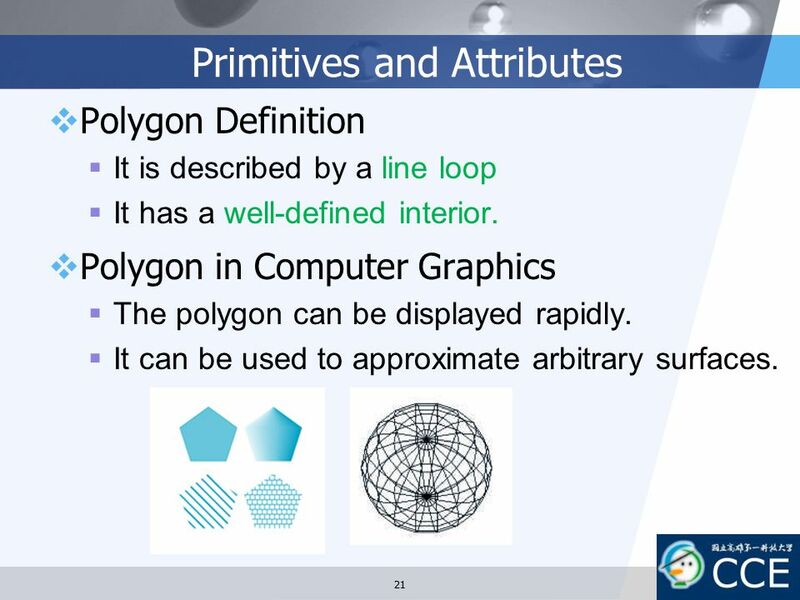 Polygon Definition It is described by a line loop It has a well-defined interior. 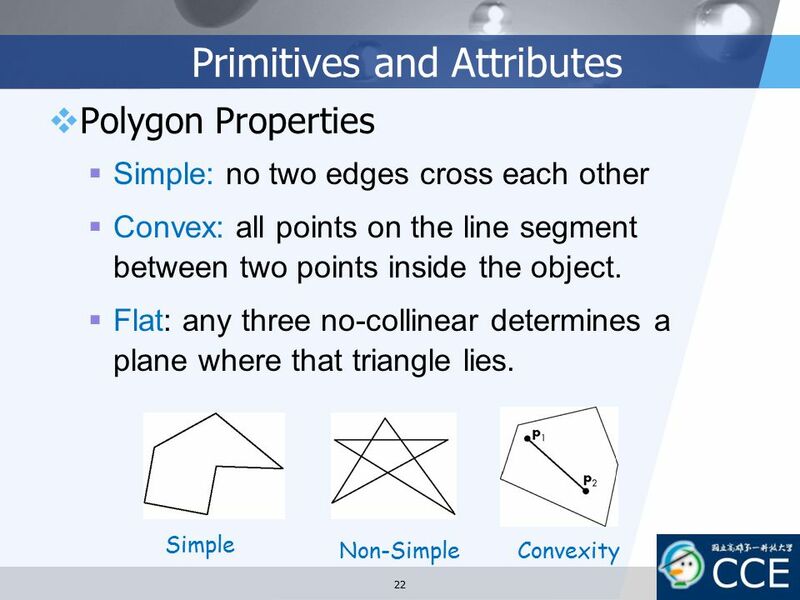 Polygon in Computer Graphics The polygon can be displayed rapidly. 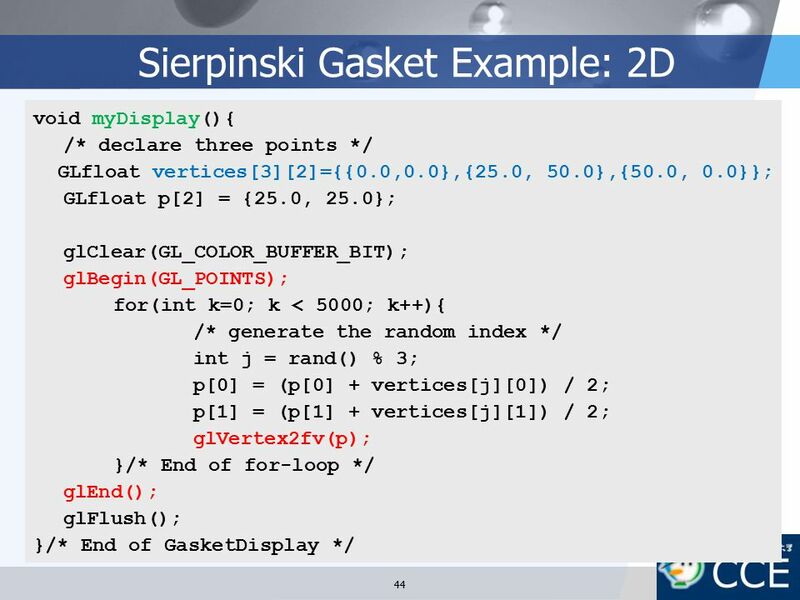 It can be used to approximate arbitrary surfaces. 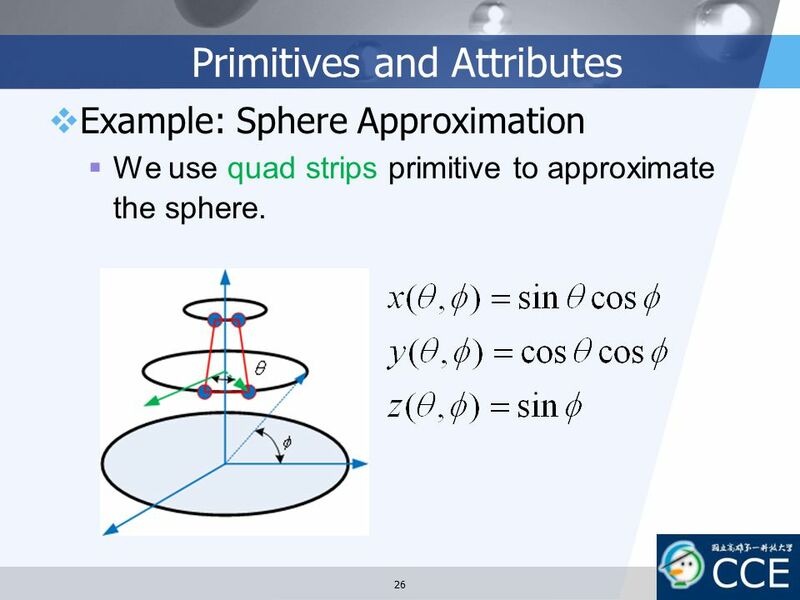 Example: Sphere Approximation We use quad strips primitive to approximate the sphere. 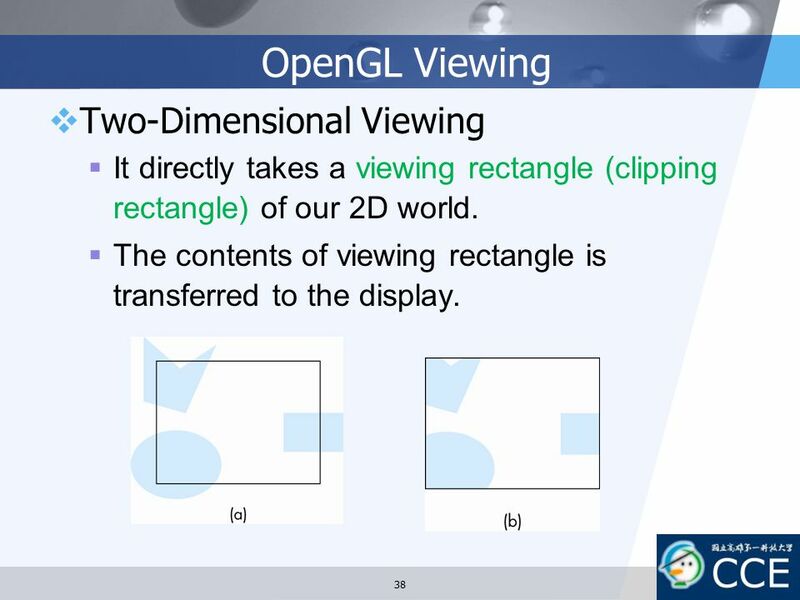 It directly takes a viewing rectangle (clipping rectangle) of our 2D world. 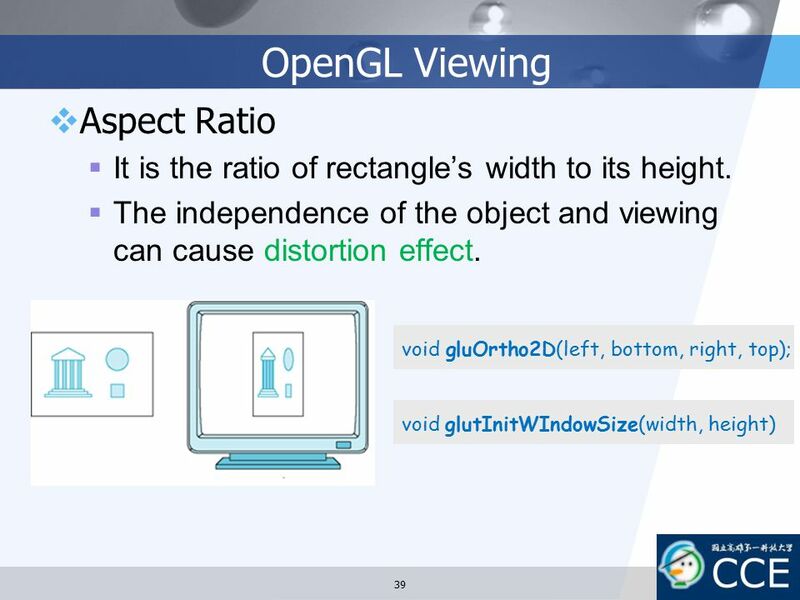 The contents of viewing rectangle is transferred to the display. 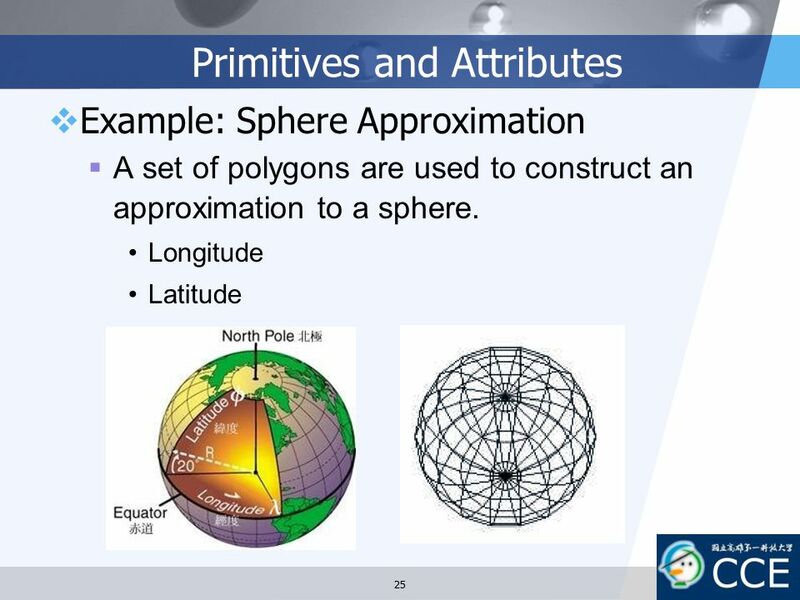 Description It is shape of interest in areas such as fractal geometry. 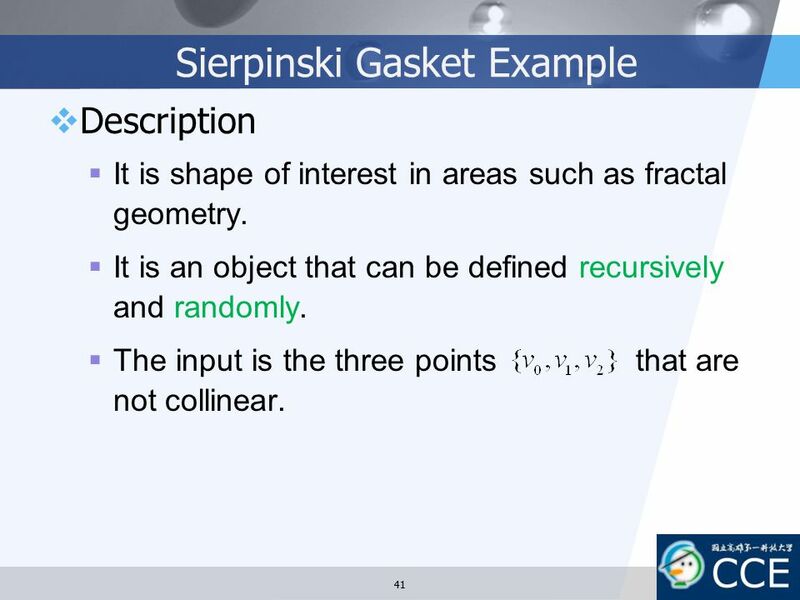 It is an object that can be defined recursively and randomly. 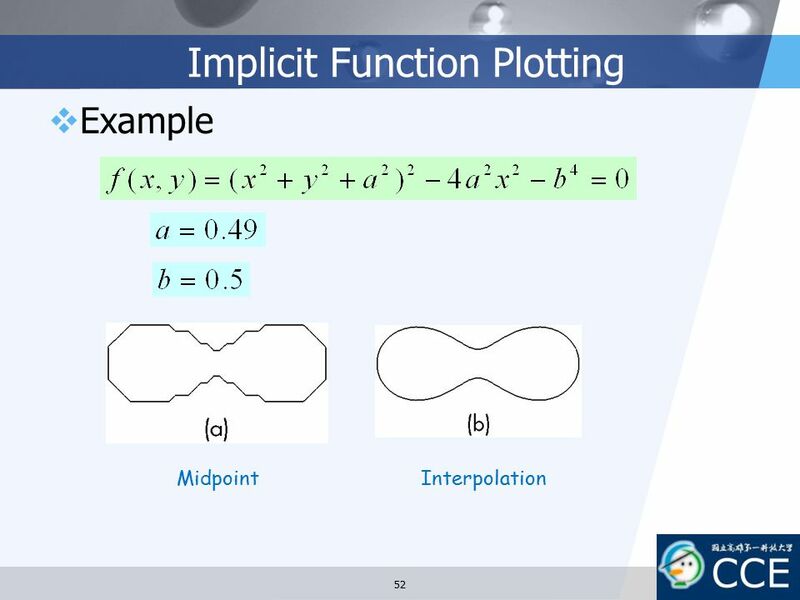 The input is the three points that are not collinear. 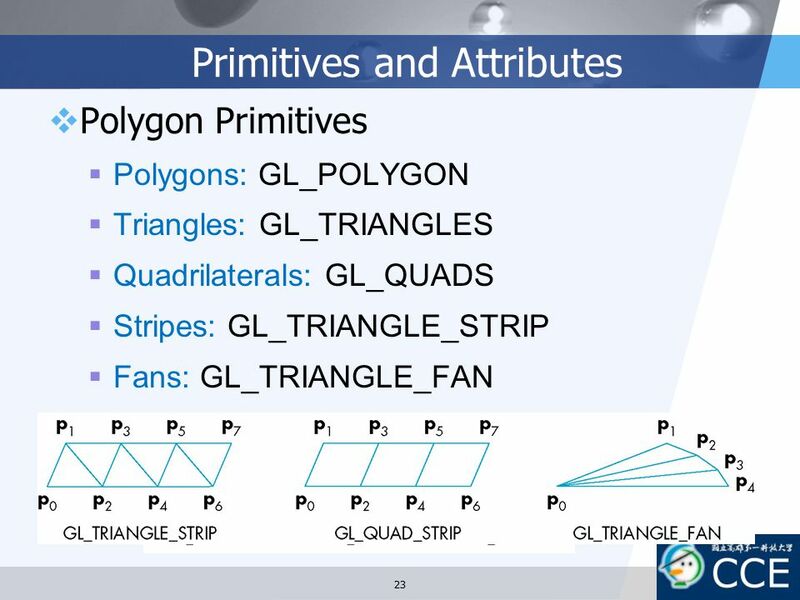 Construction Process Step 1: Pick an initial point inside the triangle. 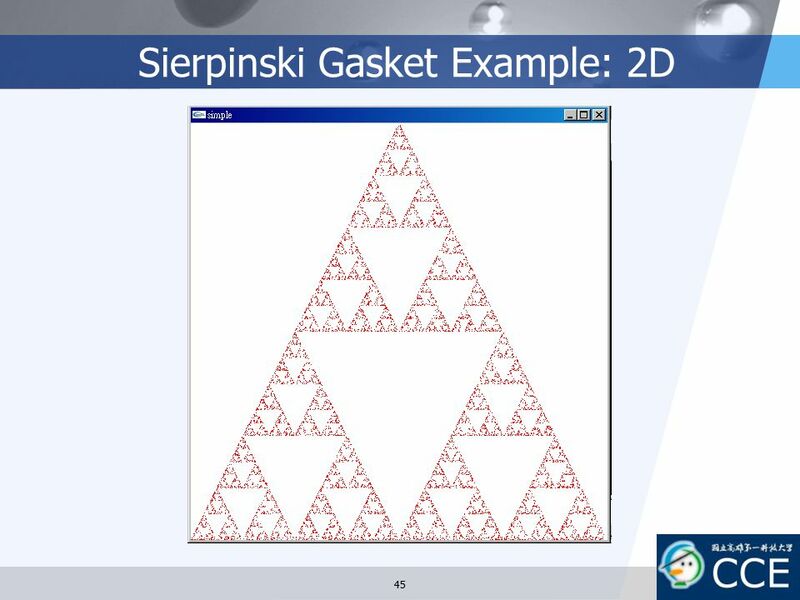 Step 2: Select one of the three vertices randomly. 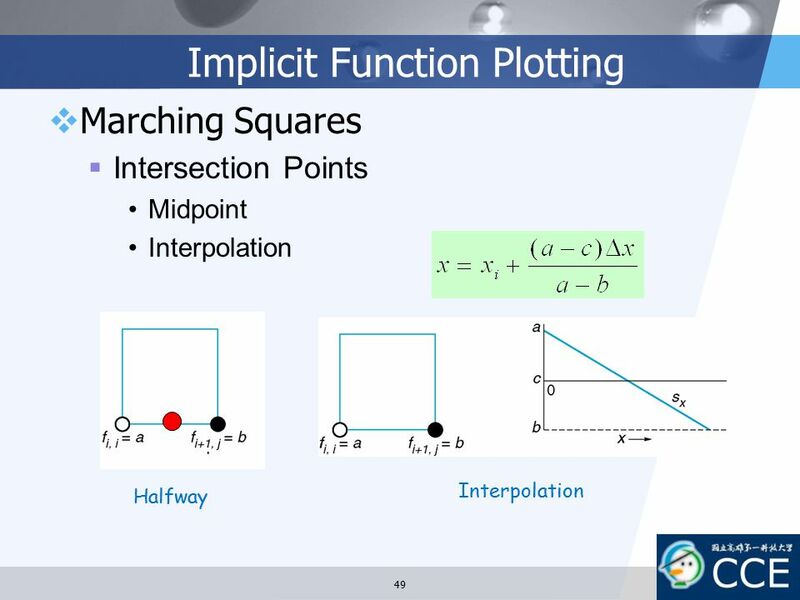 Step 3: Display a marker at the middle point. 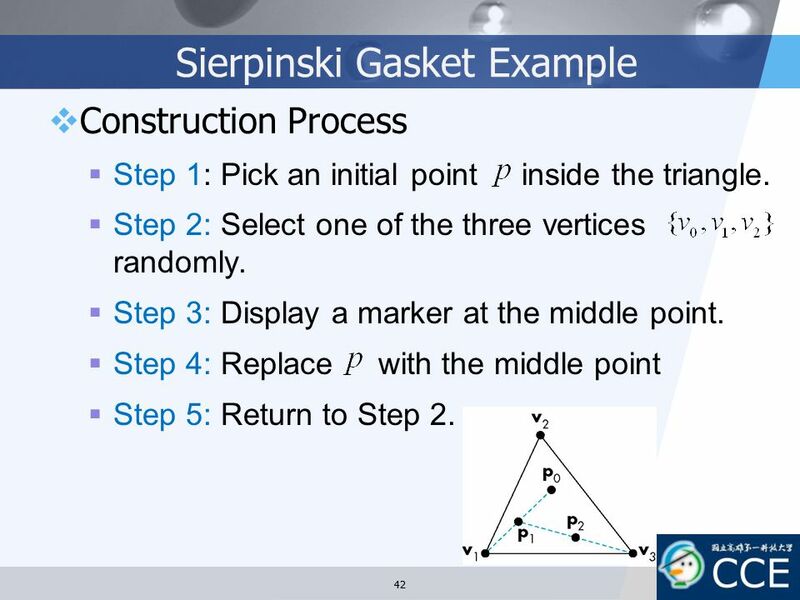 Step 4: Replace with the middle point Step 5: Return to Step 2. 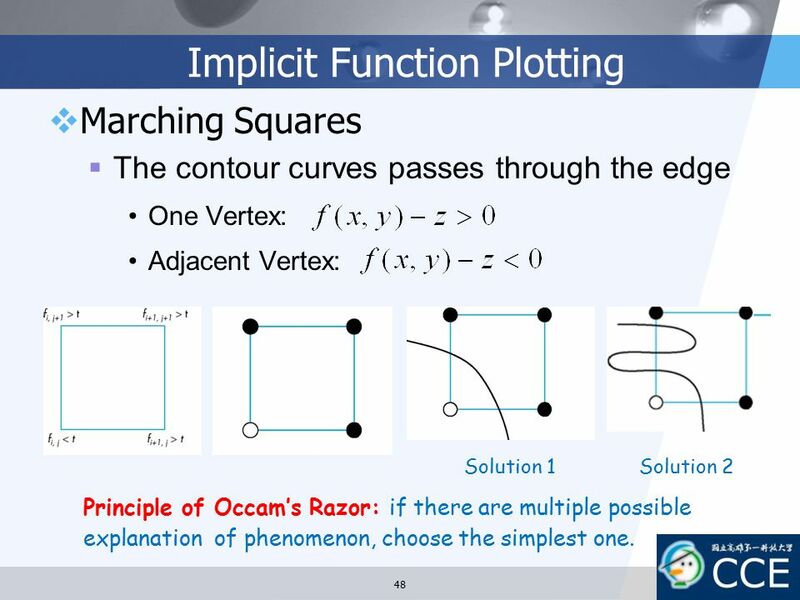 Marching Squares The contour curves passes through the edge One Vertex: Adjacent Vertex: Solution 1 Solution 2 Principle of Occam’s Razor: if there are multiple possible explanation of phenomenon, choose the simplest one. 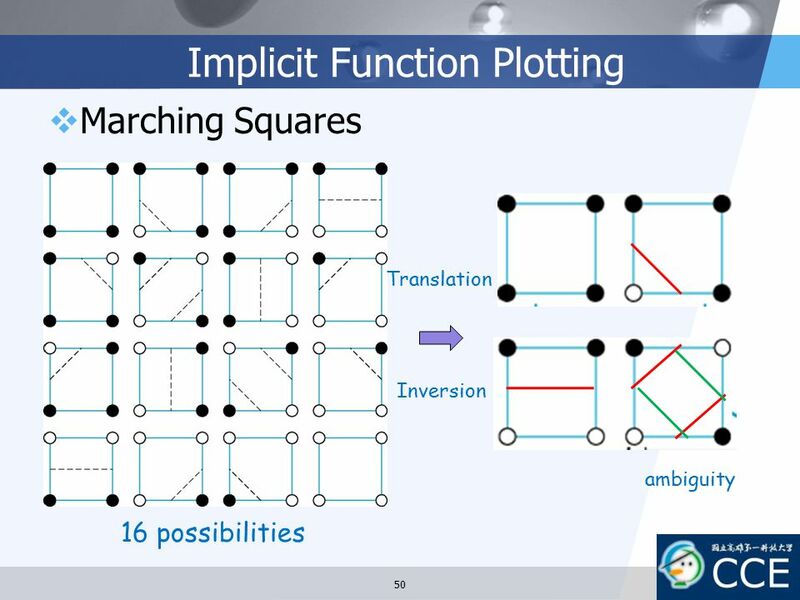 Marching Squares Ambiguity Effect We have no idea to prefer one over the other. 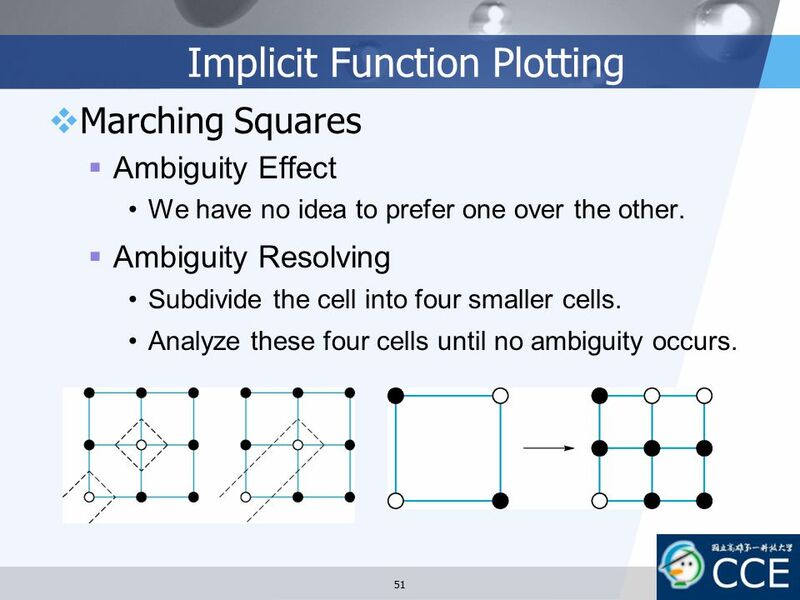 Ambiguity Resolving Subdivide the cell into four smaller cells. 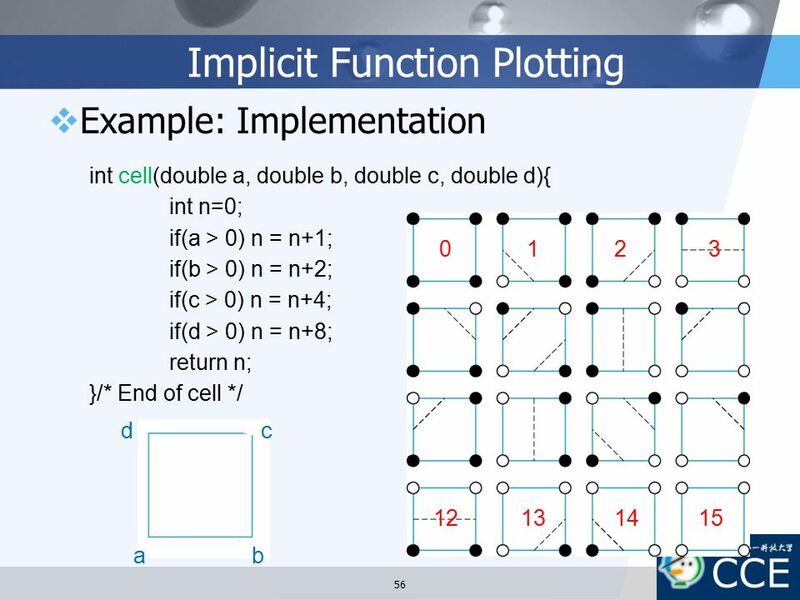 Analyze these four cells until no ambiguity occurs. 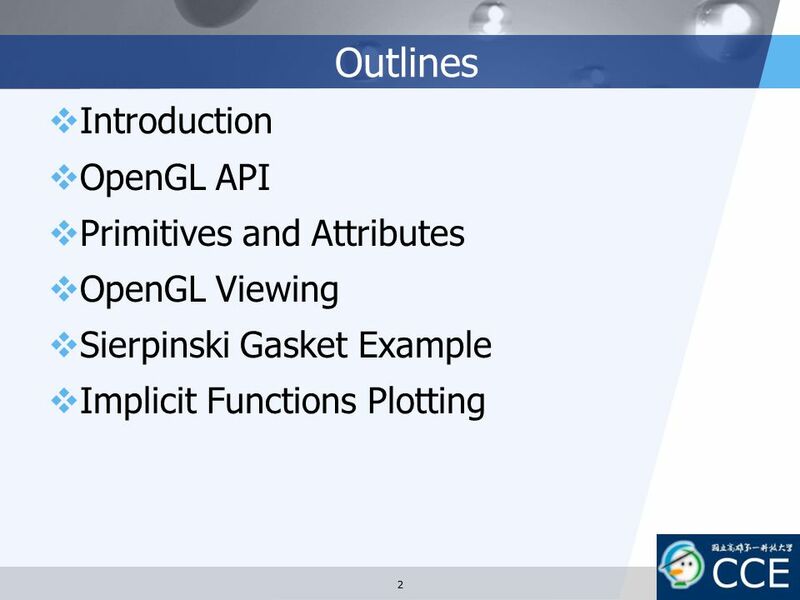 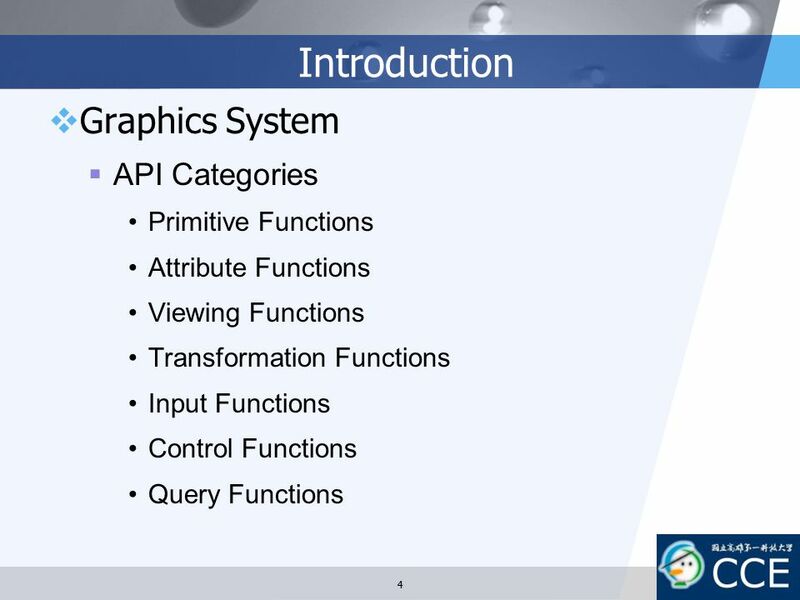 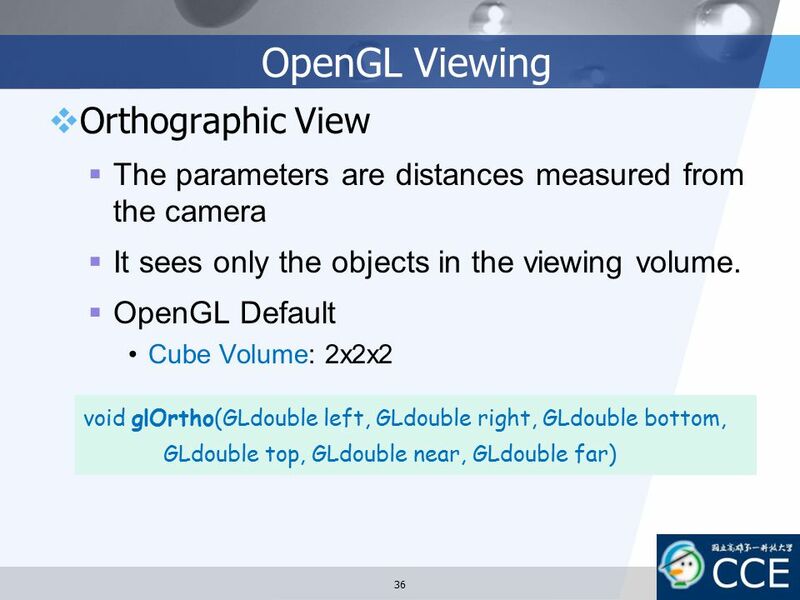 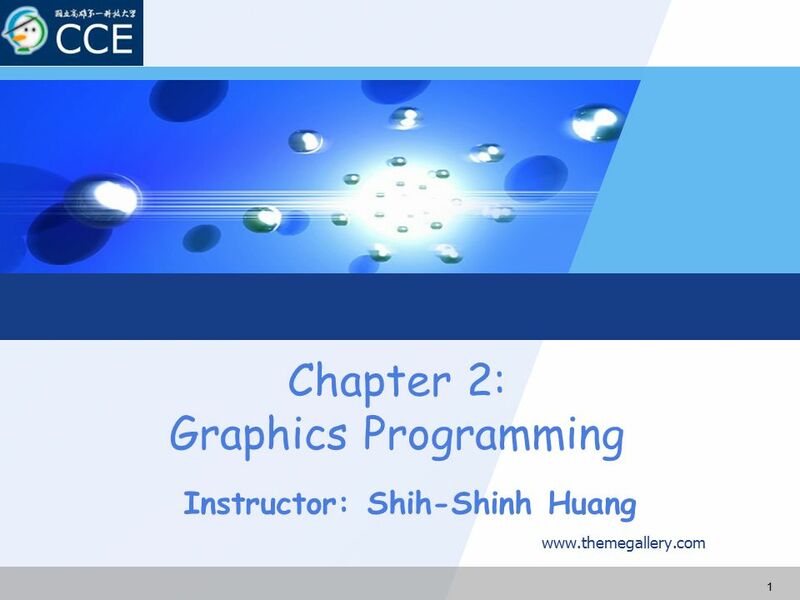 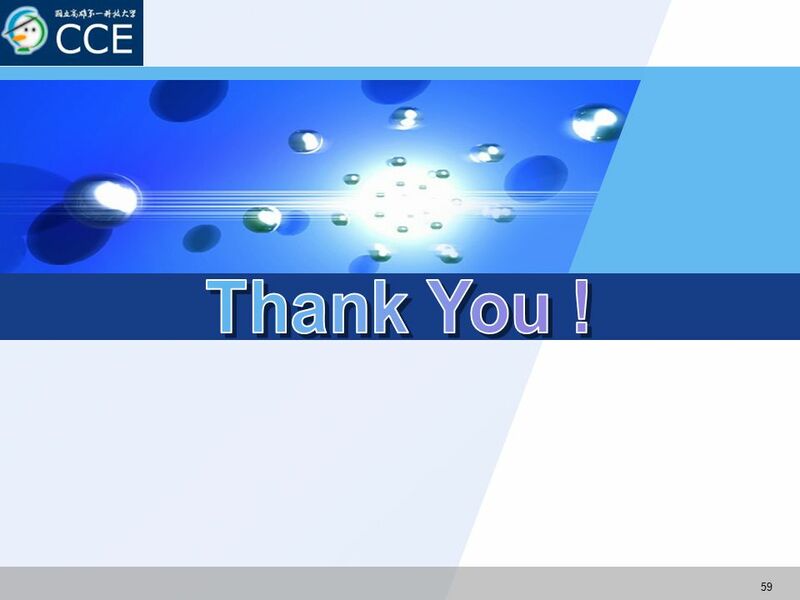 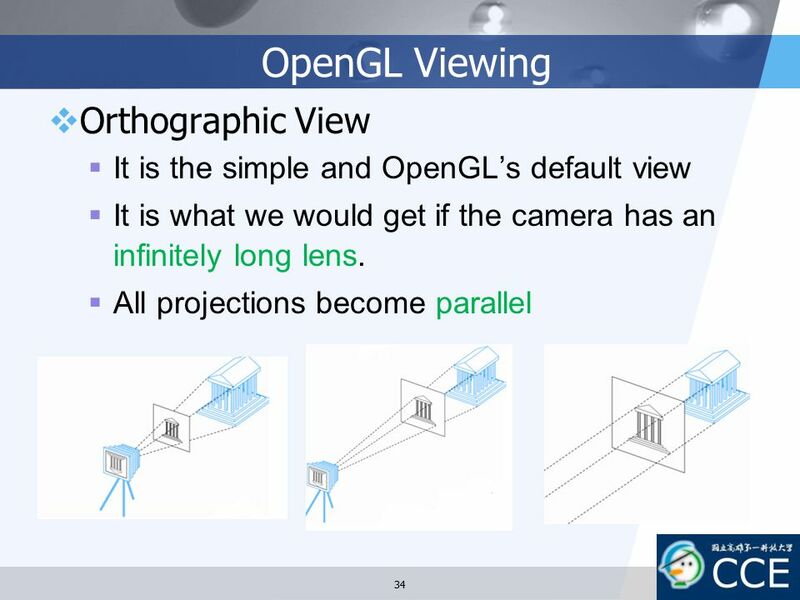 Download ppt "Chapter 2: Graphics Programming"
Programming with OpenGL - Getting started - Hanyang University Han Jae-Hyek. 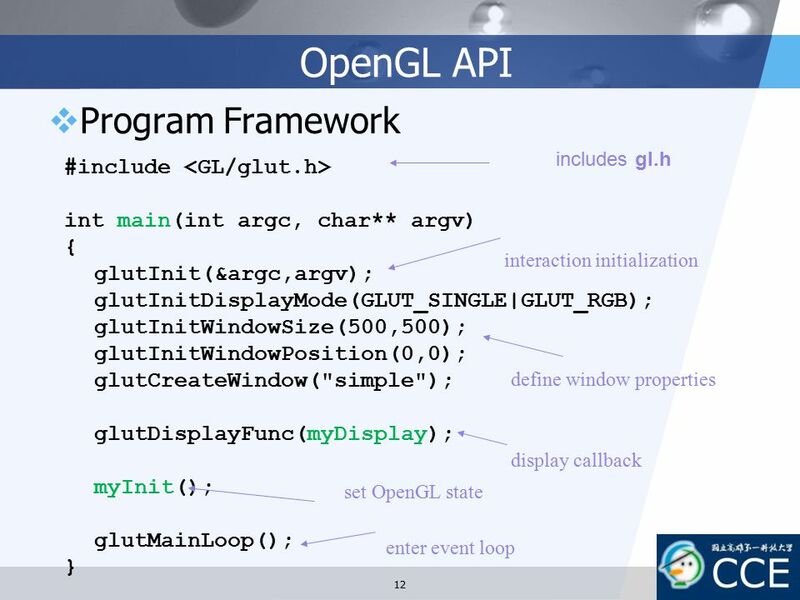 OpenGL Open a Win32 Console Application in Microsoft Visual C++. 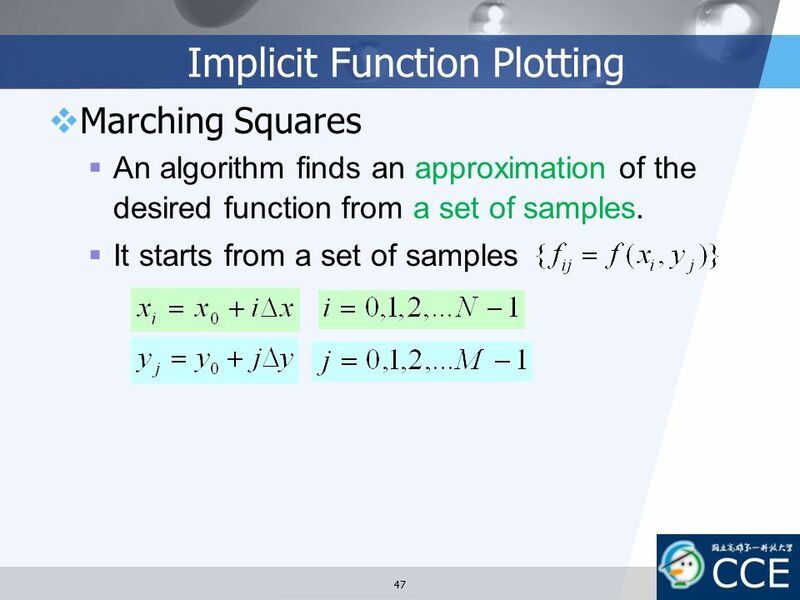 School of Computer Science University of Seoul. 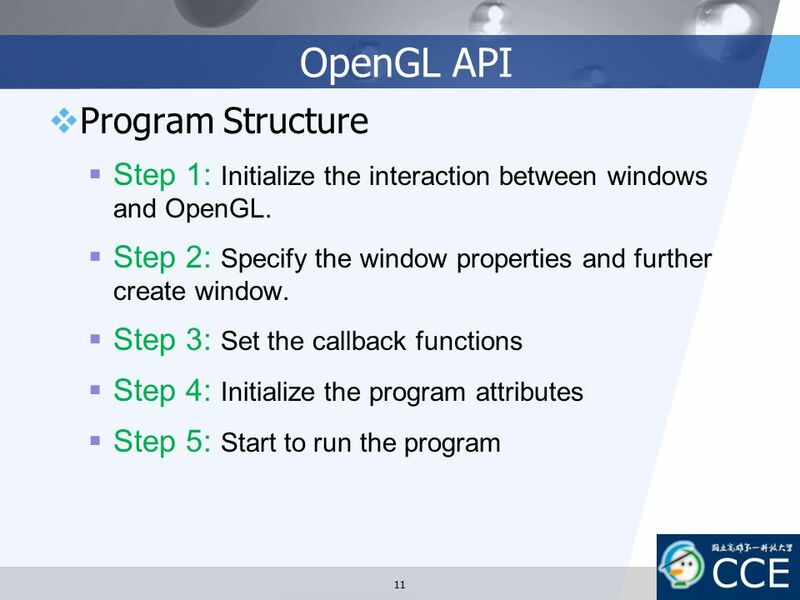 How can we create a window? 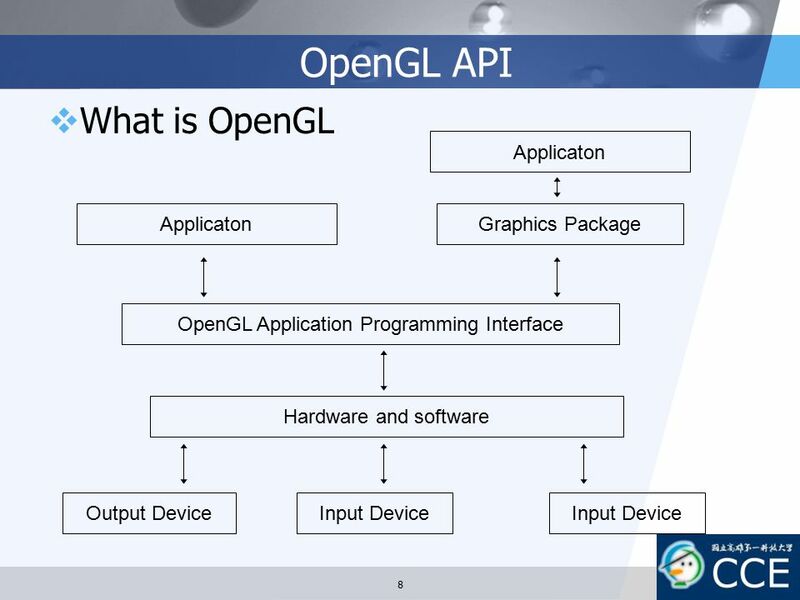 How can we handle the events? 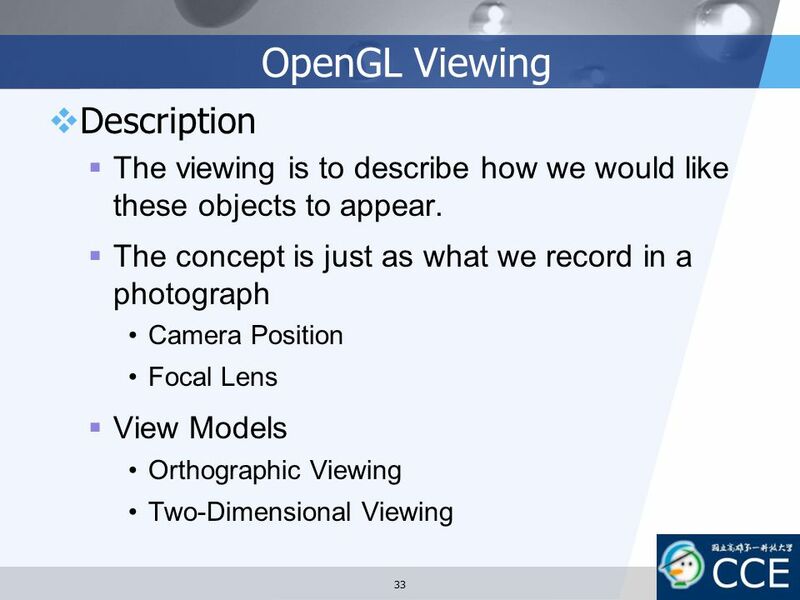 What kind of objects can we render? 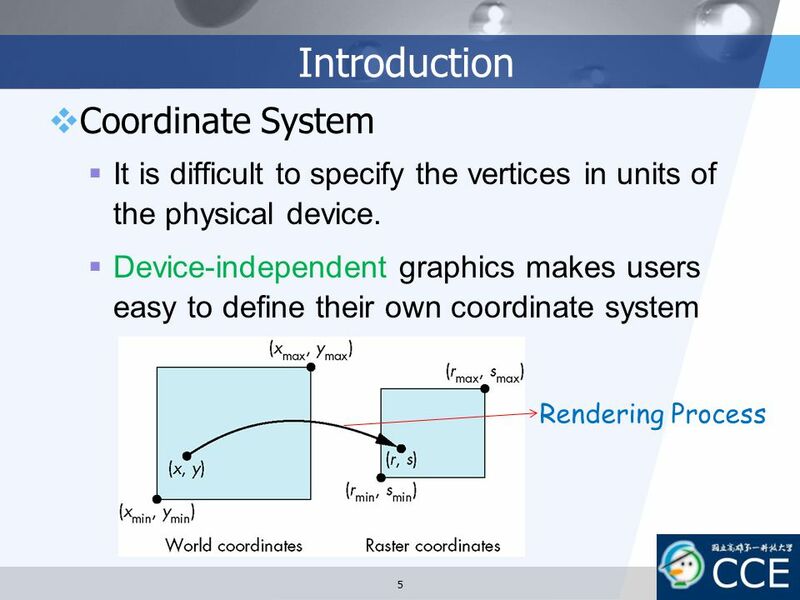 How can. 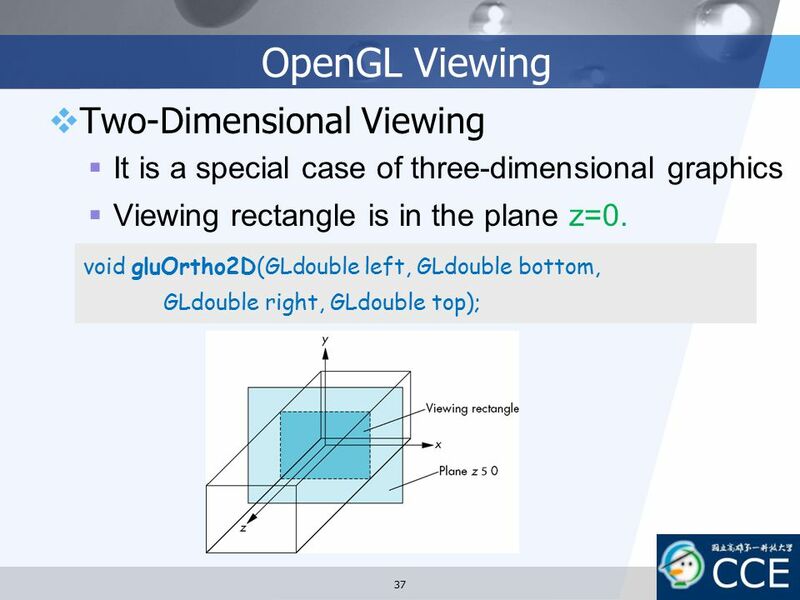 ©Zachary Wartell, UNCC9/28/ :30 AM 1 Overview of OpenGL Revision: 1.2 Copyright Professor Zachary Wartell, University of North Carolina All Rights. 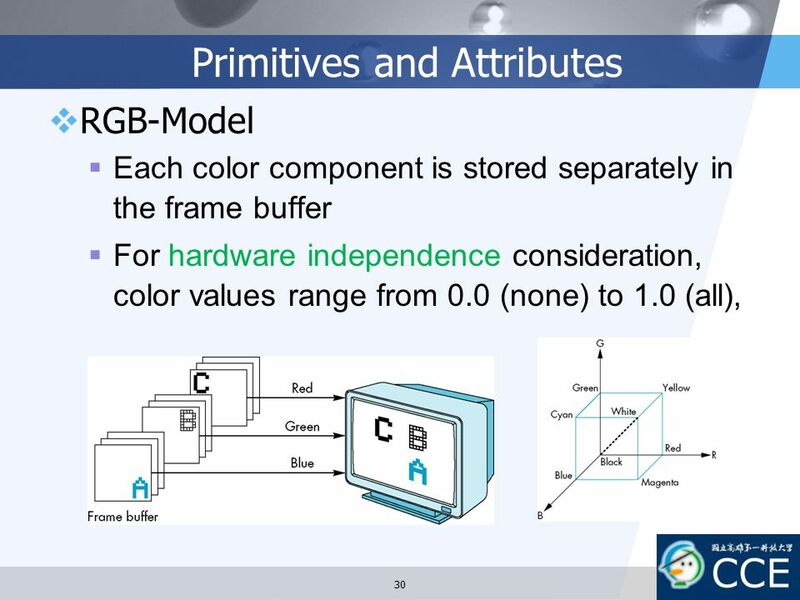 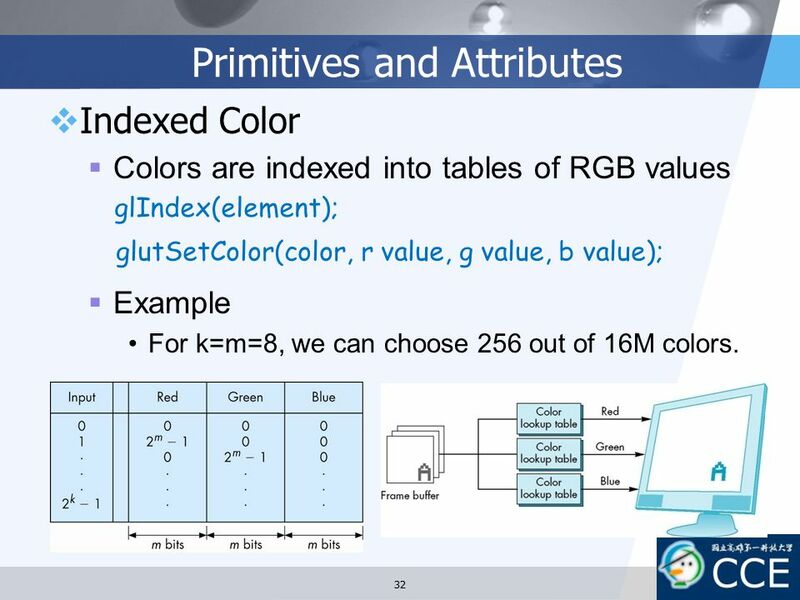 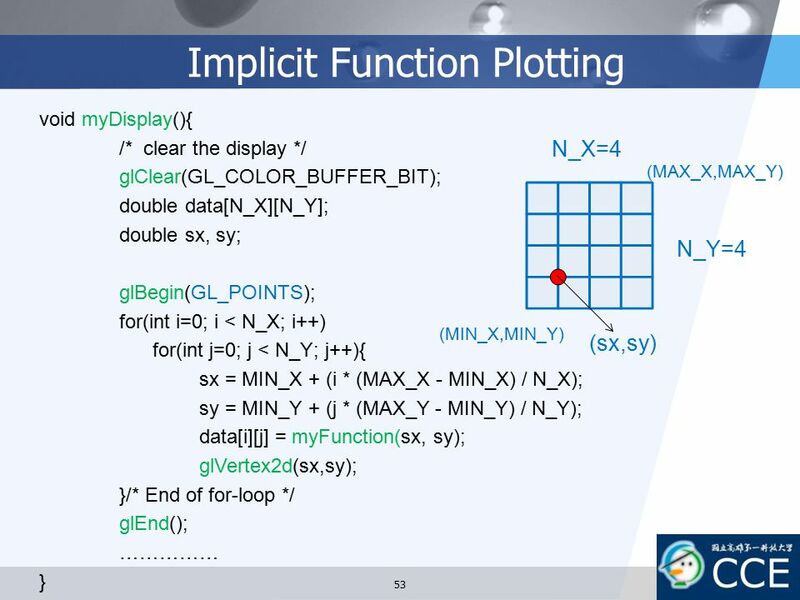 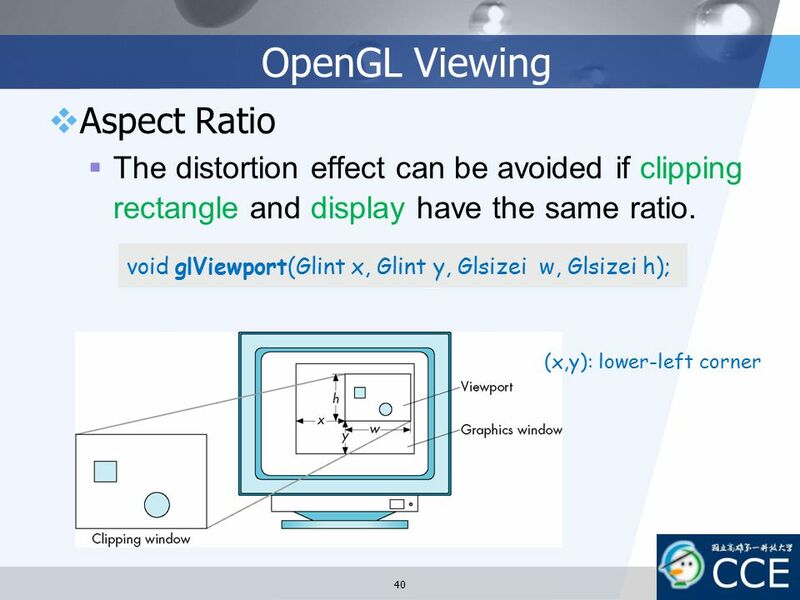 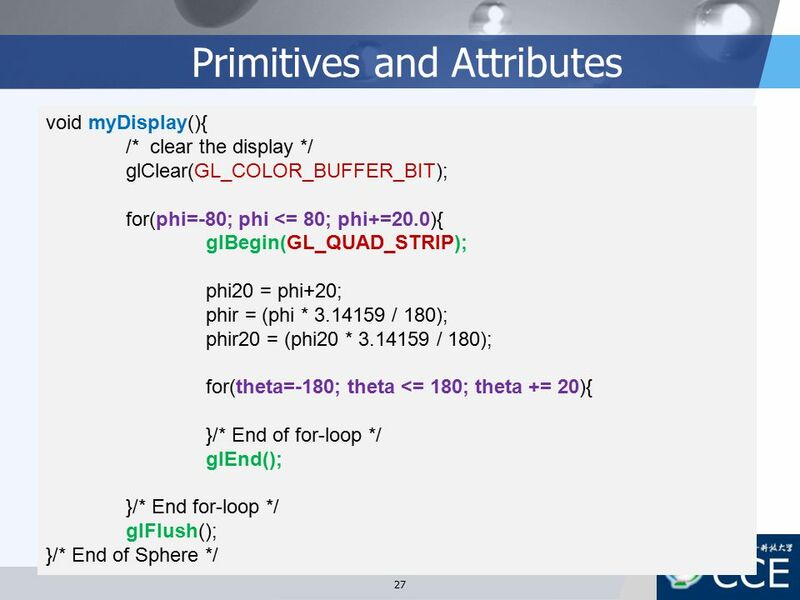 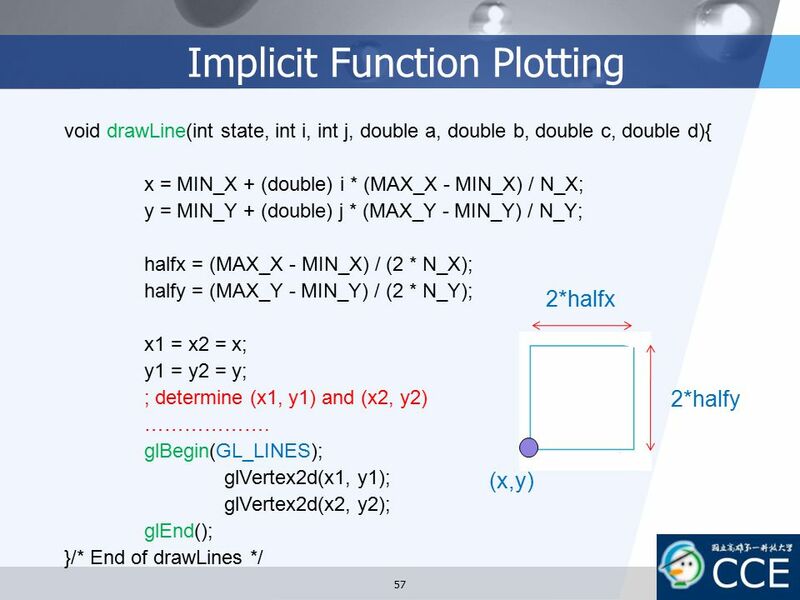 CS 4731 Lecture 2: Intro to 2D, 3D, OpenGL and GLUT (Part I) Emmanuel Agu. 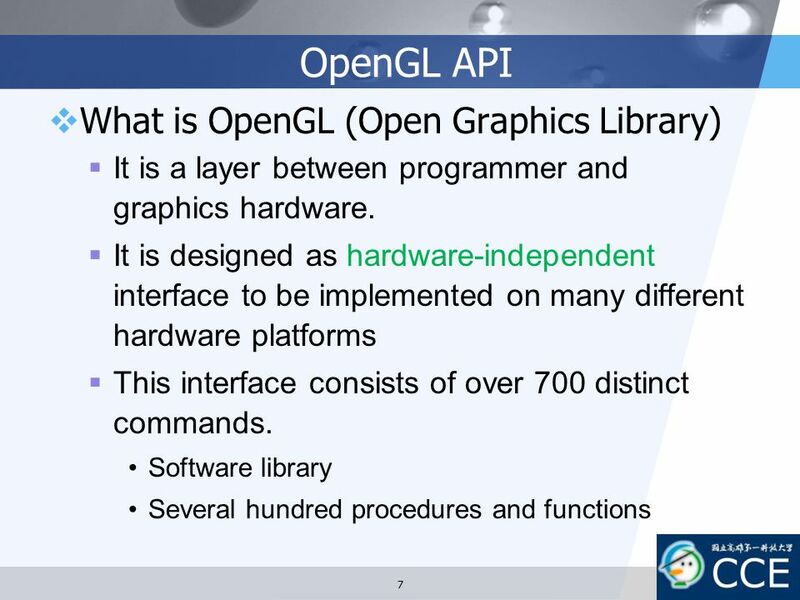 OpenGL (Graphics Library) Software Interface to graphics software Allows to create interactive programs that produce color images of moving 3D objects. 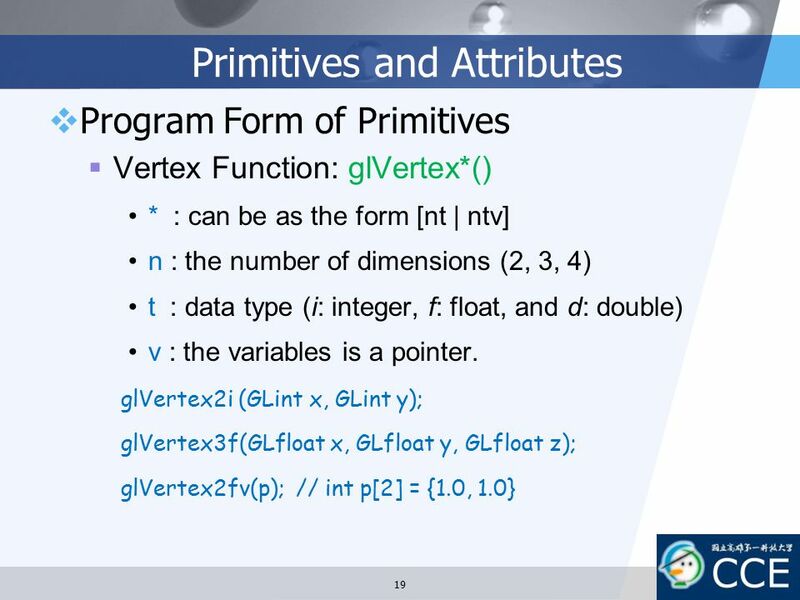 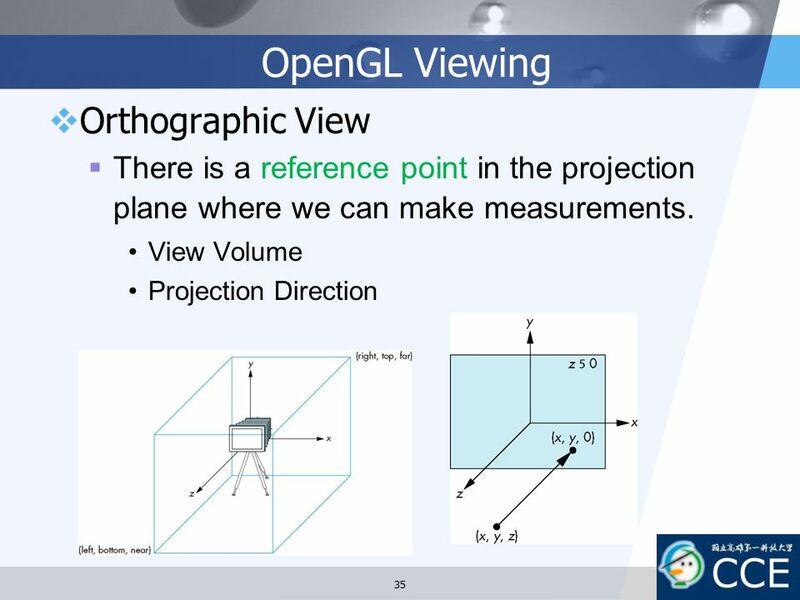 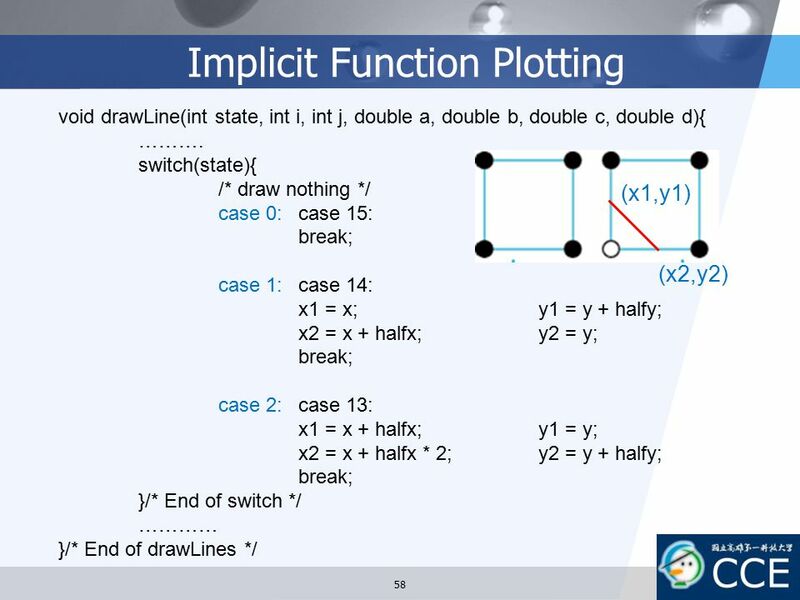 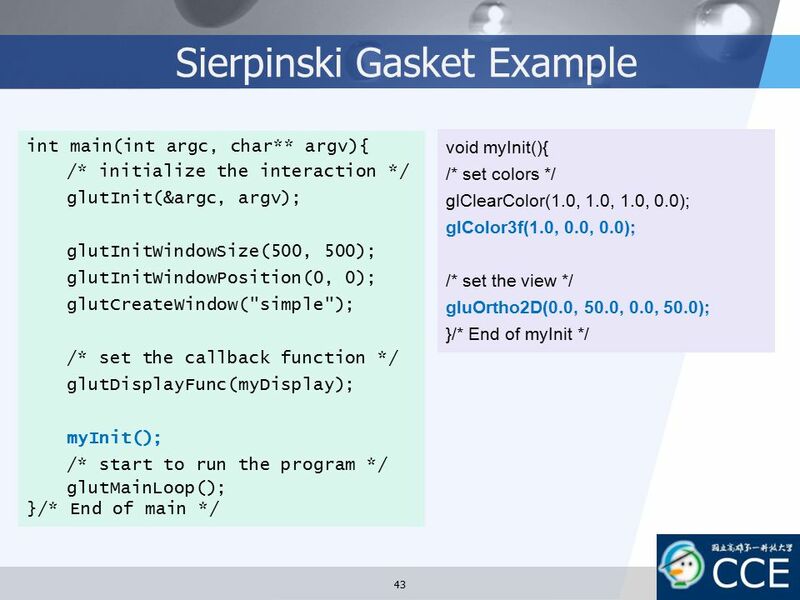 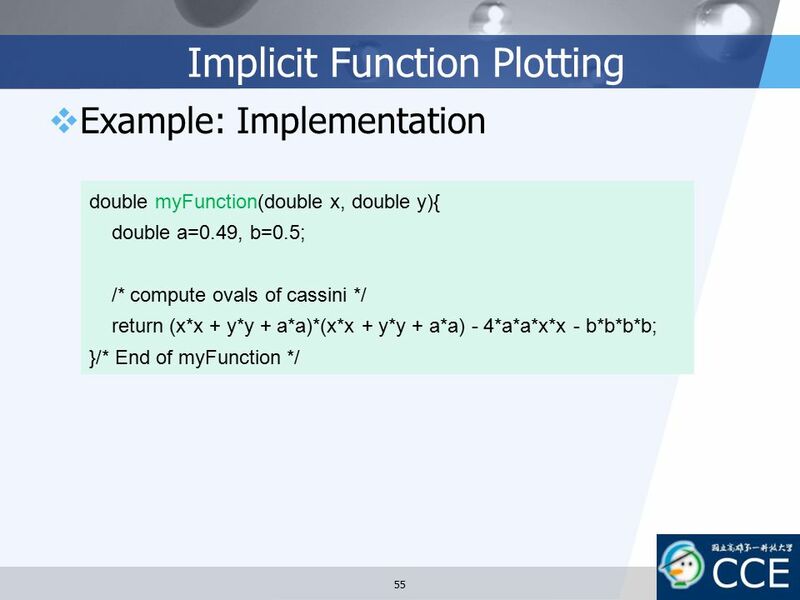 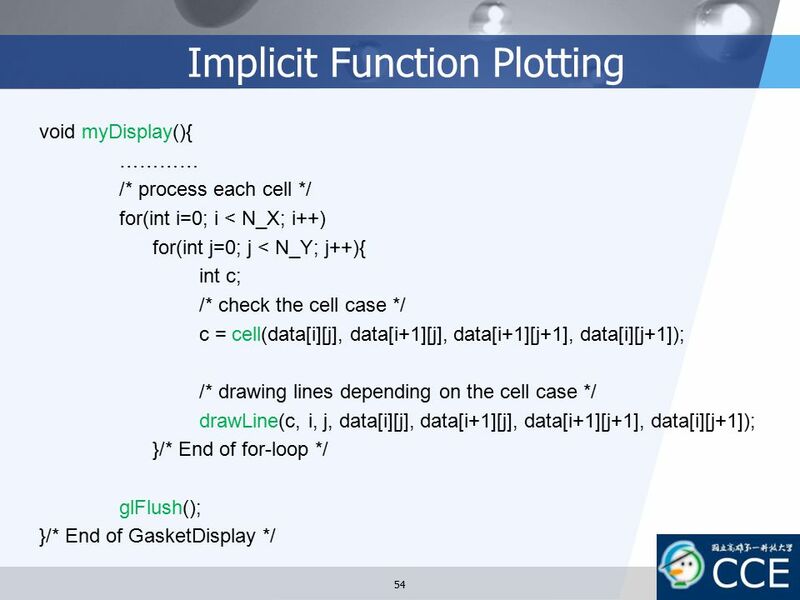 CSC 461: Lecture 51 CSC461 Lecture 5: Simple OpenGL Program Objectives: Discuss a simple program Discuss a simple program Introduce the OpenGL program.